So Sue is a cute sewing, knitting and quilting blog. She is making some cute projects over there, like this quilted floor mat, wow! 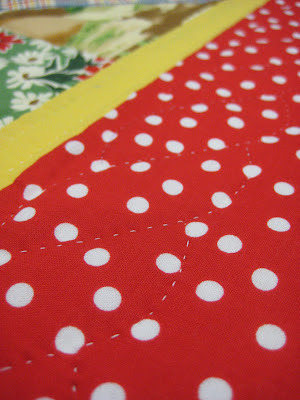 I love the bright cheery American Jane quilt here, just a sweet happy project. I love half square triangle projects, I just want to sew! Be sure to visit So Sue and spent some time on her fun crafting blog. I finished making the American Jane Happy Camper quilt! I pieced the top earlier this year with one pack of triangle charms, but was disappointed at how small the quilt was, so I tucked it away somewhere. However, when I got myHinterberg quilting hoop, I needed a hand quilting project, and that's when I decided to add some borders to this quilt to make it bigger. My local quiltingstore doesn't carry this line, but we did what we could to match it as best as we can. I love the way this came out! I love this "Happy Camper" line by American Jane. This quilt measures approximately 40"x40" and was entirely hand quilted! My favorite parts of quilting are making the binder and putting the finished quilt through the washer for the first time. I love the way hand quilted quiltsfeel like after coming out of the washer. It's so soft and vintage looking. I used two sheets of color catcher since there is quite a bit of red in this quilt; I was afraid it may bleed. Here is a photo of the hand quilted feather pattern I used in the border. I absolutely enjoyed hand quilting on my new Hinterberg quilting hoop. I already have my next quilt planned out for another hand quilting project. A very nice and happy quilt. Great job! Thank you for featuring me today and sharing my project with Quilt story!! :) what an honor! What a happy quilt! Great job!